We officially announced the 2014 winners of our annual 180 Medical College Scholarship on August 1st, 2014, and since that time, we have been featuring each one on our blog as the fall semester progresses. 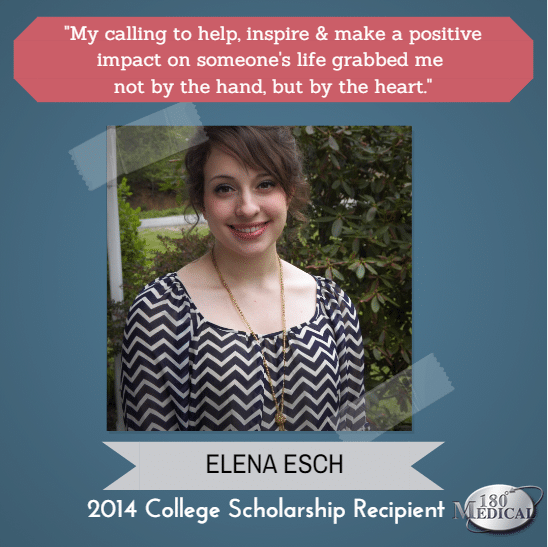 Today, we’d love for you to meet the last of this year’s inspiring recipients, Elena. Elena was born with Spina Bifida. From the time she was 3 months old, she began to undergo surgeries to repair her spine. Although the surgery was considered successful, to this day, she cannot feel her foot or much of her leg. Elena has achieved much so far throughout high school. She was an active member of multiple clubs, as well as presided as Senior Class President and acted as a Student to Student Ambassador Leader and Mentor (Anti-Bullying Program), all while maintaining a 4.0 GPA. She was an AP Scholar with Honors and belonged to the National Honor Society, and she was honored with the 2013 Rotary Youth Leadership Award, among many other achievements. We’re sure Elena will go far in life, and it’s so exciting to be able to contribute a piece to Elena and all of our bright, young scholarship winners’ futures!